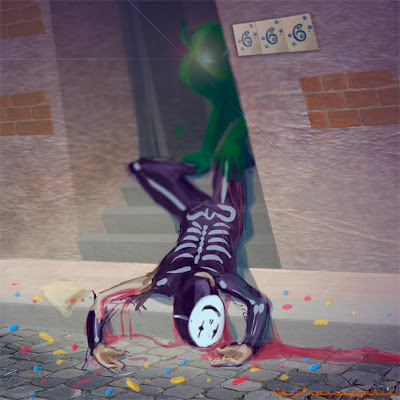 Xtian's illustration blog: 41 - "Trick or Treat"
sometimes you win, sometimes you lose AHA ! a few years ago, the superstores tried to force halloween into europe. we have this long habit of bying any sh*t from america we see on tv, so everybody thougt it would be a good idea to import this american tradition here and in the same time extinguish the century lasting tradition of all saints as we know it here. this of course, only to make us buy more useless gadgets and eat more sugar. turned out it didn't work. no relation, I heard this song last afternoon in a bike shop and it's been in my mind ever since. it's in yours now, don't thank me. hope your week-end is just as spooky as you'll like it.